C. H. F. Peters discovered asteroid #144 Vibilia and #145 Adeona. Alexander Graham Bell transmitted the first wireless telephone message on his newly-invented "photophone." The first long distance electric power transmission line in the United States was completed, running 14 miles between a generator at Willamette Falls and downtown Portland, Oregon. The Goodyear airship "Pilgrim," the first with an enclosed cabin, made its first flight. The 200" (5.08 m) Hale telescope was dedicated at Palomar Observatory, California. A construction contract for Launch Complex 34 at Cape Canaveral, Florida, which became the site of the first Saturn launches, was awarded. Actual construction began on 8 June. Ten million shares of the Communications Satellite Corporation were offered in its initial public stock offering. Northrop-Ventura began qualification testing of the Earth landing system for Apollo with a drop of boilerplate 19 at El Centro, California. The entire landing sequence took place as planned, all parachutes performed well. NASA launched Gemini 4, during which Ed White became the first American to "walk" in space. 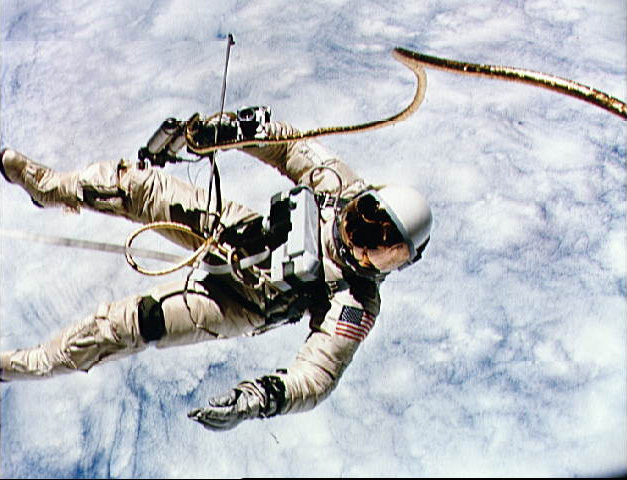 Ed White became the first American to walk in space, and the first to use jet (rocket) propulsion on a space walk. NASA launched the Gemini 9 Earth orbiting mission carrying Tom Stafford and Gene Cernan. The science fiction television series Star Trek aired its final new episode after being canceled by NBC, allegedly because of poor ratings. The show had premiered on 8 September 1966, and has become the most widely rebroadcast program in history. USSR launched Cosmos 285, possibly a solar flare monitor, for investigation of the upper atmosphere and outer space. A Soviet supersonic Tupolev Tu-144 crashed at the Paris air show near Goussainville, France, killing 14, the first crash of a supersonic passenger aircraft. NASA launched Hawkeye 1 (Explorer 52) to conduct solar wind experiments. USSR launched DS-U3-IK S/N 5 from Kapustin Yar, but the first stage failed 84 seconds after launch. The crew of USSR Soyuz 36, Farkas and Kubasov, returned to Earth aboard Soyuz 35, landing 140 km southeast of Dzehezkazgan. USSR launched Cosmos 1374 into orbit, a subscale version of the Spiral space plane. Cosmos 1374, launched 3 June 1982, was a subscale version of the USSR Spiral spaceplane. After 1.25 revolutions of the Earth, it was deorbited and recovered by Soviet naval forces in the Indian Ocean at 17 degrees South, 98 degrees East, 560 km south of Cocos Islands. It made a 600 km cross-range maneuver during reentry. The recovery was filmed by an Australian Orion reconnaissance aircraft, revealing the configuration to the West for the first time. E. F. Helin discovered asteroid #3767. USSR launched eight communications satellites, Cosmos 2187 - Cosmos 2194, into orbit from Plesetsk, on a Kosmos 11K65M booster. An Ariane 44L launched from Kourou carried the Inmarsat 3 F4 and Indian Insat 2D communications satellites to geostationary orbit. Inmarsat 3 F4 was positioned at 54 deg W, Insat 2D at 72 deg E.
NASA's STS 96 (Discovery) undocked from the International Space Station (ISS), ending the first docking of the Shuttle to the ISS. NASA's Curiosity rover observed the planet Mercury transiting the Sun, as viewed from Mars, marking the first time a planetary transit was observed from a celestial body other than Earth.